She can now drive herself to and from school (when I’m feeling benevolent about letting her use my car). She’ll be taking the SAT in a couple of weeks. And last night, she attended her first concert. “It’s not my first concert,” she corrected me last night. That’s true. A couple of years ago, she and her cousin caught a band at a club all the way in Upland, thanks to the generosity of her dad and uncle, who accompanied them. And several years ago, she and that same cousin saw The Cheetah Girls at Universal. But Ed Sheeran last night was her first time seeing a legitimate musician perform in a large venue — without parental chaperones. True, she and her friend had to depend on us to get to the Nokia Theatre (her provisional drivers license does not allow her to take underage passengers). But we bid her goodbye at the end of the line waiting to get in to the theater and for the next four hours, they were on their own. We have been Megan’s parents for nearly 17 years, and “date nights” have become an increasingly rare occurrence for us. This has less to do with her than the stress and pressure of the bad economy. My husband comes home too tired to go out, and with college looming just a couple of years away, we tend to talk ourselves out of activities that cost a lot of money. This concert forced us to get out and try to have a good time. I was determined to prove we were up to the challenge, even though we are kind of rusty at it. 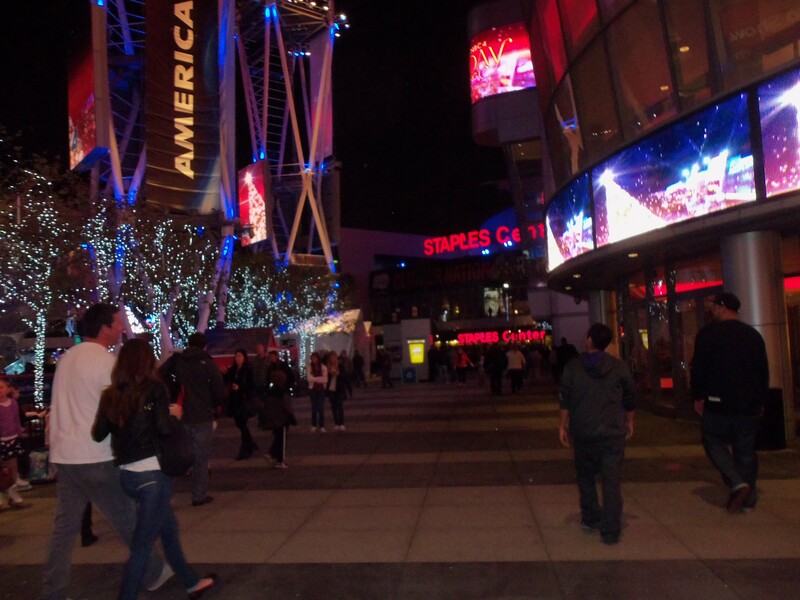 The Nokia Theatre and the complex that has grown around it have been city attractions for over five years, but we had never spent an evening there together. For longtime residents of Los Angeles, it’s a little bit of a shock to see LA Live in all its neon glory. “It’s like our own Times Square,” my husband marveled. And with a concert about to begin, the place was packed. Any concerns I had about the concert were filed away when I noticed that the crowd consisted mainly of teenage girls (and the parents who brought them). Satisfied that this would not be a rowdy show with rampant drugs and underage drinking, we bid the girls goodbye and walked down the street to a place I discovered when I attended the LA Auto Show in November: The Figueroa Hotel. We are both fans of historic buildings, and this one qualifies (by LA standards, anyway): It was dedicated in 1925 as a YWCA residence, and was converted into a hotel during the Depression. 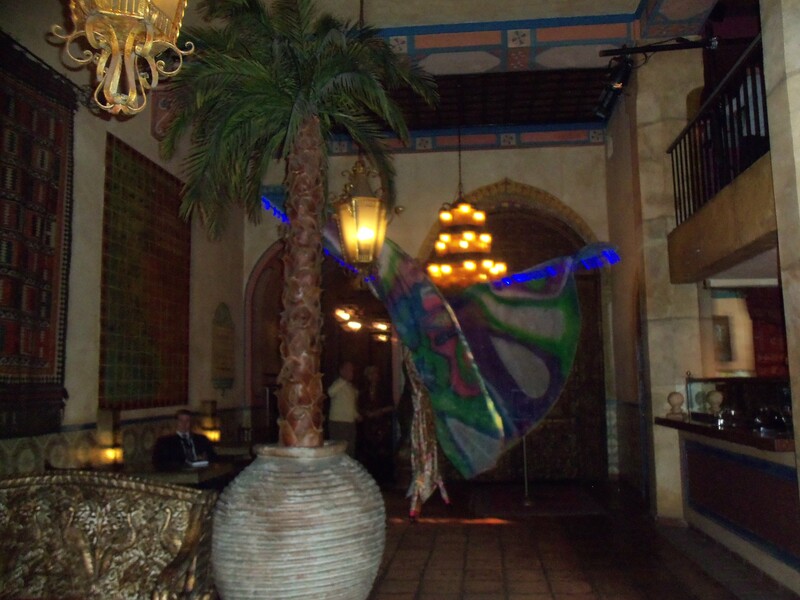 It was given a Moroccan-inspired makeover around the time that LA Live debuted, and its proximity to the entertainment complex makes it a natural venue for tourists and business travelers. During the Auto Show, it was the venue for a lavish party hosted by Hyundai. The minute I stepped into the lobby, I knew I had to bring Gareth there some time for a drink, because he would love it. And he did. He had to spend some time walking around the tiled pool area before we settled in for drinks in the adjacent Veranda Bar (which is where the heaters were located last night). We sat down, we drank, and we even talked about things that had nothing to do with the kid (this is rare for us these days). This was a win-win! We had an 8:00 reservation at Katsuya, back at LA Live – so we finished our drink and walked on back. Katsuya is one of those restaurants where the interior design (by Philippe Starck) is as much of an attraction as the food; exactly the type of place we rarely visit any longer. It is very bright, very modern and the Japanese-fusion signature dishes are very good. I am allergic to some kinds of seafood, so I cannot tell you how my husband’s shrimp and crab orders were — but my seared tuna sashimi with avocado and salsa was out of this world, as was the salmon roll dotted with caviar. Obviously, Katsuya is not a destination if you are on a budget, at least, not if you are trying out the “signature” dishes they are known for. I was tempted to go for the Omakase tasting menu which would have allowed us to sample most of these — but that costs $75 per person. (“You know we’re going to end up paying that much anyway,” I said.) But Katsuya also offers a Prix Fixe option for just $25, as well as some Bento boxes for about the same. Now that I’ve tried some of the signature dishes, I may opt for the budget options the next time. But that salmon and caviar roll might be too hard to resist. Our bill did come to $140, but that included our drinks, so we did spend a bit less than the Omakase would have cost. It was a little after 9:00. Our daughter’s 8:00 concert included TWO opening acts. We were going to have to kill some more time. “Let’s get dessert,” my husband suggested. Our first thought was to find ourselves a comfortable perch at the JW Marriott, which is just across the promenade from the Nokia, but the lobby turned out to be crowded and we found its modern decor to be cold and uninviting. It was also literally cold last night, and we were both woefully unprepared. We walked back out and decided to try Wolfgang Puck’s restaurant. Yeah. I have never heard of a restaurant running out of dessert, either. I realize it was a Sunday night — but a holiday weekend with a sold-out show at the theater. A manager approached us with a card. “We’re so sorry. Come back with this card and we’ll give you 20% off AND free parking,” he said. Now that’s how you do customer service. Instead of being upset about being turned away, we walked out feeling good about the place. The Farm was still serving dessert and coffee. Gareth ordered the blackberry cobbler. I don’t usually get dessert, but last night I made an exception and asked for the apple crumble. Both were served hot and came topped with vanilla bean ice cream. I tried to eat it slowly, but that was tough. It was just too good. It was approaching 10:00 and we could see the staff preparing to close. We finished, paid our bill and made our way back to the hotel lounge, where we found a couple of empty seats that allowed us to keep our eye on the Nokia. I ordered one last drink for the evening: a taste of Lagavulin. “I consider this the price of renting these seats for the next hour,” I said, estimating the cost at around $30. It was actually $26 — and I think it was a double shot, because I did not finish it. It was hard to estimate its volume, as it was served in a short tumbler, filled to about a level of just 1/2″. From our vantage point inside the hotel, we could see that the show had ended. Masses of teenage girls were pouring out of the theater and running back toward the parking structure, looking like a 21st century version of “Hard Day’s Night.” Our daughter and her friend eventually caught up with us and we made our way back there too and we passed the crowd of girls, all waiting expectantly to see the singer. My daughter shook her head. “I guess they don’t know he already left,” she said. I’m not sure how she knew that he was gone, but I’m just as certain she was right. It was a good night for all of us. My daughter and her friend got to see a favorite singer perform live. My husband and I got to spend some real quality time with one another, without the distractions we have at home. As that, as they say, was priceless. My Husband’s family treated us to dinner at the Brentwood Katsuya…it was also for the beautiful people, and quite loud.